*Okay, I'm not sure where I am in the list, but it must be somewhere close to this. This video is a repeat performance of the last few meals at our house. They've taken to singing at meals, and this is one of David's favorite songs from last year and this year at OSRUI. I think he can't quite handle the lack of song sessions and general camaraderie now that he's back home so he's taken to organizing his siblings into these impromptu song sessions. ...you gotta run through the puddles! There's something magical about a rainstorm after a long stretch of hot, sunny days. There's a feeling in the air...there are puddles to be splashed! 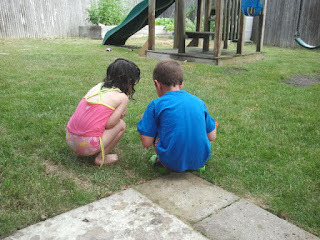 And there's an extra level of giddiness when your mama says, "don't worry, we can wash everything later!" Some days...you just have to embrace the puddles. I've blogged about my garden adventures a little bit before. This year, I haven't actually written any posts about it, but my garden is looking bee-yoo-tee-ful! We came home from camp to sprouting and flowering and bursting....thanks, Grandma, for the great watering help! 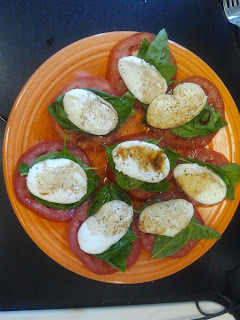 And with the rest, I made pesto. 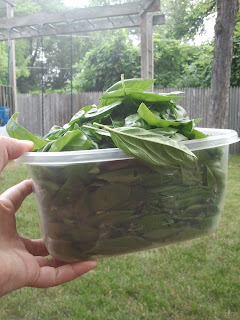 Gobs and gobs of beautiful, delicious, amazing pesto. 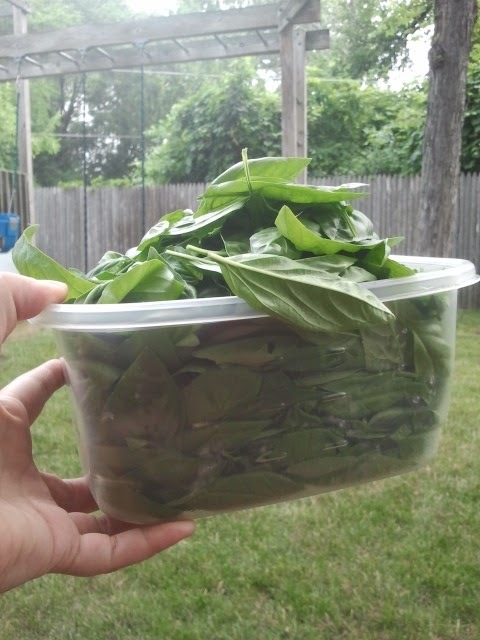 about 4 cups of basil (washed well), handful of walnuts (no pine nuts in the house), about a 1/2 cup of olive oil, a lot of garlic, salt and pepper...whizzed together in the food processor until perfect, then added about 1/2 a cup of shredded parmesan cheese and mixed once more...then voila, delicious. I decided to freeze most of it in cubes. Since I have an automatic ice-maker, I had once upon a time bought ice cube trays for a project. 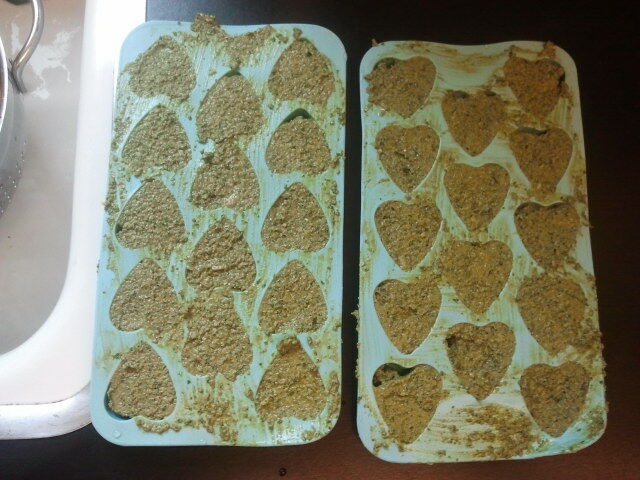 Yes, they're heart shaped. No, it doesn't really matter! And now I have a whole big bag full of pesto cubes just waiting to garnish food, drop into soups and sauces, spread on toast....yum! What's your favorite thing to do with the produce of your garden? ...at least, my Sammy does. 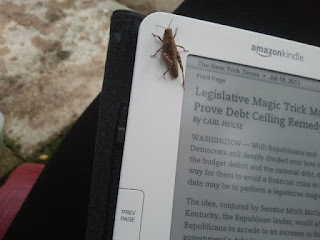 He is totally into bug hunting. In a serious way. Today he found a grasshopper in the yard. 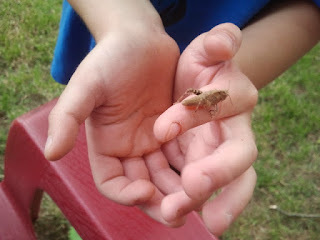 It required a lot of re-catching before he could show it to me because it kept hopping out of his little hands. He was giggling so hard about how it felt bouncing around in his cupped palms. And he provided much amusement for the whole day....he's actually kinda cute...in a bug-sort of way. Last night, I noticed a tweet from Rabbi Jason Miller, sharing with me an article written on the Forward's Sisterhood blog. I read it at about 5am, while nursing the baby. A little ironic, no? It struck me particularly hard, since I have had a little bit of a difficult week in terms of balance. Let me explain. I'm currently serving on faculty at camp, as you may know. With me at camp are my husband and three children (the oldest is a camper, so I'm not only not responsible for him, I don't even get to see him very much! ), and we are accompanied by a teenage babysitter. The babysitter generally shepherds the two older kids to their activities, while my dear husband spends his time with the baby. Often, the baby accompanies me to programming as well, since he likes very much to be the center of attention! Camp is a great place for my family - everyone has something that they enjoy doing, and we fall into a nice routine of sharing our lives with our friends at camp. For various reasons, my husband kindly agreed to go along on a 3 day camping trip with one of the older units. He left early Monday morning. On Monday, my babysitter started to feel a little ill and began to run a fever...so she went home, ideally just overnight, to speed up her recuperation (she is fine and will be back soon, I hope!). So...I was left all alone with my kids AND my responsibilities to camp. So far, so good. I've weathered this minor storm, my friends have helped out and pitched in, and it's been fine. I am definitely looking forward to both of them returning to share the work, but I am not overly upset about how this has gone. But it's definitely on my mind, making sure that everyone gets what they need from me. 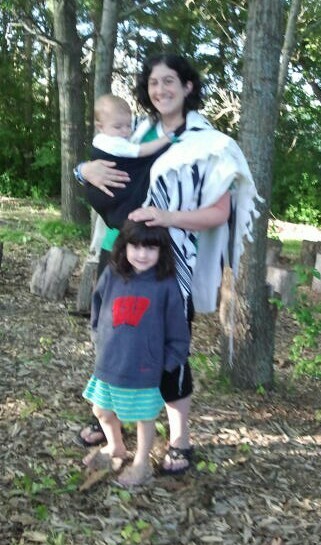 Note the camp attire (flip flops), baby sling, and tallit. Just another day as the ima on the bima...well, not so much bima at camp. More like tree stump! I do not know the writer of this article. And I do not actually feel that her post was, in fact, an appropriate response to the post that she cites, a post about young mothers in the rabbinate. Instead, I feel that Chasya-Uriel Steinbauer is trying very much to attack other mothers while justifying her own choices. This is remarkably common and prevalent on the internet - there are so many "mommy bloggers" who want to judge, rebuke, comment upon, and generally dismiss anyone who makes choices different from their own. The comments that I received when I posted this article on Facebook helped me to feel a little less alone when reading Chasya-Uriel's post - it was definitely a case of "I thought it was just me." But I was relieved to know that I am not the only one insulted by her simultaneous dismissal of my rabbinate and parenthood. 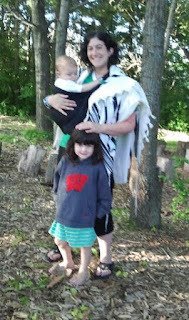 "I don’t think congregations are concerned with how motherhood might interfere with a mother’s ability to do the job as rabbi; rather, I suspect congregations are concerned with hiring someone who is obviously allowing a rabbinic job to interfere with motherhood. And I have to agree. I would rather see at least one parent at home full-time with her/his baby or toddler — ideally the birth mother, unless the child is adopted. This is what is best for the baby." Chasya-Uriel continues: "I do think that ima eventually belongs on the bima." "I agree with Rabbi Levy that all women, mothers or not, should be given the same chance to serve the Jewish community as their male counterparts. But women and men who are parents should be prioritizing serving their babies and toddlers before they prioritize serving the Jewish community. We also need to honor the unique relationship a new mother has with her baby. The attachment formed, especially when breastfeeding, is unparallel to that of the second parents, whether a father or another mother. We need to allow what rabbinic work we have accomplished up until now to be put on hold, trusting that we will be much better mothers because of our earlier experience as rabbis. If we have set up our lives in which we tell ourselves that we “have” to work or attend school while having a baby, perhaps it is time to reexamine our lives and reprioritize so that we can find a way to be with our children." I am both a mother and a rabbi. Some days I'm more ima. Some days I'm more bima. (See blog title.) Some days, I'm trying to make it all work. But I don't think I'm doing it wrong. I just know that I'm doing it. I've created four wonderful little people and my husband and I delight in their growth of body and spirit. We definitely juggle, we definitely argue over who goes where and when. My children do not play multiple sports or attend a lot of extra programs. I do serve in small ways on the PTA but I'm not in the classroom helping out. I don't "do it all" but I do what I do. I try to do it all as well as I can, with as much love and attention and energy as possible. My children are washed and fed and cared for and loved by their parents. Most of their care is done by my husband or by me, or by Grandma or Bubbie & Zeyde, or some of our wonderful team of babysitters and friends who help us out. My congregation never fails to share my delight when my oldest sings in the Junior Choir or the baby accompanies me to Torah Study on Shabbat morning. I am often scolded for not having them around, since many people feel love and "ownership" of my children. I feel so lucky and blessed to have so many people who care about the well-being of my children and my family. There is absolutely no question that I would be a different rabbi if I did not have children. Would it be better for my children? Would it be better for my career? Would it be better for my congregation? Would it be better for the Jewish people? I strongly believe that the answer to all of these questions is NO. Please enjoy the time that you are spending with your daughter. Cherish every moment. Please know that many people (women and men) who came before you have enabled you to spend that time and make that choice. Please know that many others have made choices different from yours. I do not judge you for your choice. Please do not dare to judge me for mine. I am intensely proud of the life I lead. I work incredibly hard at all that I do, trying to be the most fulfilled person that I can be - while loving and growing and raising my family. I respect and admire my friends in all forms of their rabbinate - women and men who are juggling and balancing and maintaining remarkable families, careers, lives. Our choices change over time, we make new decisions based on the situations in which we find ourselves. Lives change. Goals change. Purposes change. Focus changes. Please remember that like the rabbinate, motherhood comes in all styles. I am most definitely enjoying mine. There's a special place in the world for the children of Jewish professionals. They live in a unique world...they are often in a fishbowl, observed on all sides by congregants. Everyone knows their names, they are public property in the synagogue. They are the kids who know all the blessings, who can answer almost every question in Sunday School, and whose parents don't let them slack off on their Hebrew homework. But they are also the kids whose parents love Judaism, who make it a part of their lives, who bring it alive in ways that many of their classmates never see. Jewish summer camp is full of all kinds of kids. Jewish kids of all shapes and kinds, with all manner of background and experience. But for my children, camp is a uniquely special place. Even though they are not quite old enough to realize it, they are making friends that will last their lifetime. And many of those friends (although thankfully not all) are also children of Jewish professionals. I hope that these are the friends that they can call when they are frustrated and fed up with their parents. Their parents who are running synagogues. And those friends will understand. This is what I hope for my children. Each morning I wake up and walk down to the Beit Tefillah (chapel) for morning prayer. Camp is usually quiet...the morning walk clears my head and I walk slowly, breathing in the morning air, reveling in the natural surroundings. Does a commute get much better than this? One of my favorite things about being at camp is the freedom that my children feel while there. We certainly supervise them, but there is no concern when they run ahead on the path or escape our eyes for a few minutes. I know there is someone who is ready to look out for them. 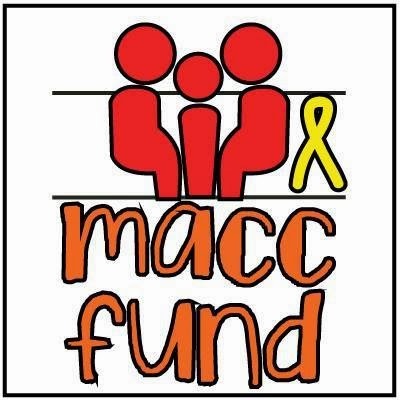 Camp is a remarkably safe way to teach children independence. We send them away from home, but we know that they're not out in the world alone. They are constantly cared for while still gaining responsibility. Their parents aren't hovering and asking them if they changed their underwear - but they are safely ensconced in a supportive and nurturing environment. Campers get to make choices, in ways that they often never get to do. They are presented with a list of activities and asked to choose. They are given the option to swim the lake or sleep in. They put the food on their own plates from the provided meals. I know that I don't need to add my voice to the many who speak of the importance of summer camp for children. But something this very true bears repeating over and over again. Because I want camp to always be there for my children and their children. This year I'm working with a group called Tiferet. This is OSRUI's arts unit - the campers in this group spend a good chunk of each day in their "Studio" groups - drama, visual arts, music or dance (in addition to all the other camp activities like swimming, sports and rest time...). Many of the traditions in Tiferet are unique and creative. Like their Beit Tefillah, which consists of a lot of stumps to sit on. The Tiferet campers have even painted canvas "stump covers" that they bring out for each service. See more Summer Stock Sunday shots at Robin's place.